The Windows Fortran compiler supports a full range of project targets including command line programs, GUI based applications, and Window's DLLs. It provides a complete 32 and 64 bit Windows Fortran compiler solution and supports mixed language development by interfacing with the Microsoft Visual Studio and Windows SDK C/C++ compilers. 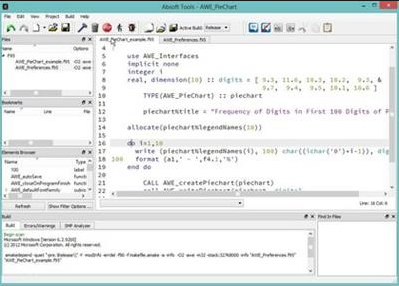 The AbsoftTools development environment simplifies code development by solving the problems associated with IDEs such as Visual Studio and Xcode - excellent for C++, but with no knowledge of Fortran. The Absoft Fortran IDE supports both Fortran and C and automatically provides proper syntax sensitivity, array indexing, etc. for each language. It includes everything you need: full Fortran 95 compiler with F2003 and F2008 features, programmer's editor, Fx3 source level debugger, application framework, graphics and optimized math libraries in a single, easy-to-use package.